1960's pop eh, did it ever get any better? - The Beatles at Shea Stadium and The Stones at Hyde Park, well this is The Four Pennies at Ewood Park (top that). These local lads made No 1 on the charts, in May 1964, with their ballad 'Juliet'. It was their only No 1. In fact, it was their only Top Ten hit, though they did make the Top Twenty a couple of times after this. 'Juliet' still gets played on the radio from time to time and although it now sounds a bit dated, it's still a nice song. To make No 1 in that particular year (1964), was no mean feat, when you consider the competition. The Beatles and the whole Mersey sound were dominant, the Stones ('It's All Over Now') and the Kinks ('You Really Got Me') had established themselves and the Animals ('House Of The Rising Sun') had also made their mark. Even Roy Orbison was back on the charts with perhaps his best known record ('Oh Pretty Woman') in this country. Does anyone remember this performance? The match was played on Jan 2, 1965 and Rovers won 5-1 against Aston Villa in the old first division. Rovers line up - Fred Else; Keith Newton, Walter Joyce; Ronnie Clayton, Mike England, Mick McGrath; Mike Ferguson, Andy McEvoy, John Byrom, Bryan Douglas & Mike Harrison. John Byrom (3) and Andy McEvoy (2) were the goalscorers. I just saw an article in tonight's paper saying it was 50 years since their number one. I told my wife and son I had seen them live at Ewood and I thought it was against Villa and we won 5-1. Cant believe I remembered it so vividly but thanks for confirming it. I was 8 at the time and was sitting on a wooden bench pitch side behind the goals at the Blackburn End. My late Dad took me and I waited after the game and got their autographs. My apologies for being late in publishing your message. I did see it just after you had posted it and I thought I had published it then, but must have forgotten. I don't think it was during a match Colin, or else they would have been in the way of Ronnie Clayton charging through the Midfield ! The stand in the background is the old Riverside Stand. I think that I've mentioned to you before Colin that Fritz Fryer and Mike Wilsh both used to attend my old school of St Peters on Byrom St and shortly after the Four Pennies had their hit with Juliet in 1964, which was written by Lionel Morten whose neice was called Juliet, they paid a visit to St Peters one dinner time which I still remember (As well as the short pants I wore at the time)Sadly Fritz died in 2007 aged 62 in Portugal. I went to that match Rovers v Aston Villa in the old first division on Jan 2, 1965. Rovers won 5-1 with goals from Byrom (3) & McEvoy (2). Rovers team was Fred Else; Keith Newton, Walter Joyce; Ronnie Clayton, Mike England, Mick McGrath; Mike Ferguson, Andy McEvoy, John Byrom, Bryan Douglas & Mike Harrison. 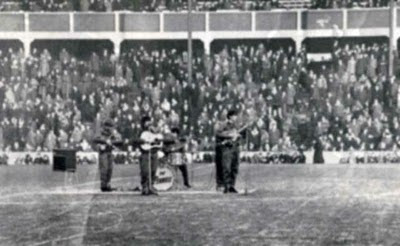 The Four Pennies played before the match and at half time. Incidentally it cost me about 1/3 to get in which translates to 6p. Did the Riverside have a stand John? I can only remember the one on Nuttall St. I think Ronnie Clayton would have managed fine, even if the Four Pennies had have been on the pitch during the game. There's now another of the Pennies dead, sadly I can't recall which one. Thanks for the info Joe. That makes sense. If their 'Juliet' topped the charts in May 1964, that season would be all but over by May wouldn't it? So by the time the 64-65 season came around, they would have been regarded as major celebrities, rather than just local celebs, so worthy of a spot playing at Ewood. Hi Colin, yes I'm almost sure that the Riverside did have a stand. Wasn't the old Nutall St Stand more of a wooden structure as opposed to the more concrete looking one in the Photo. I think that Lionel Morten is still knocking around so the other member of the group you say is no longer with us must be Alan Buck. Yeah John, you're right, it did have a stand, I had a look at some other photos later. I don't really remember it, even after seeing the photos. I remember the Nuttall Street one well enough though. It is Alan Buck that's also dead. I read it the other night and now you've named him, I remember the name. The Riverside part of the ground you can see in the distance did have a stand and also terracing underneath. The stand was deemed unstable in about 1986 (soon after the Bradfor fire)and no-one was allowed to use it. The whole side was closed too if there were high winds. Soon after that the whole stand was demolished and myself and many hundreds used to watch the match from the hiilside. Jack Walker then donated the steel to erect the stand that is now in place - the one with seats spelling out ROVERS. The Nuttall Street stand was made of wood and that was demolished in 1993 when the whole of Ewood was rebuilt. Hi Joe - Yeah, in the mid 1970's I even stood on the Riverside a couple of times, but more surprisingly, stood on the Blackburn End (and sometimes the Darwen End)even more often, from where you would see it even better. Not sure of the reason, but I just can't remember it. its odd you dont remember the riverside stand colin as it survived untill the mid eighties. reidy's new store in penny st.in 64? or is my memory playing tricks again! Your right celtadf,i remember my older sister taking me to see the four pennies opening Reidys on Penny St,or where they just promoting there no1 Juliete, i think Mary Reidy had something to do with naming them The Four Pennies,they where , or where going to be called The Lionel Morton Four ? 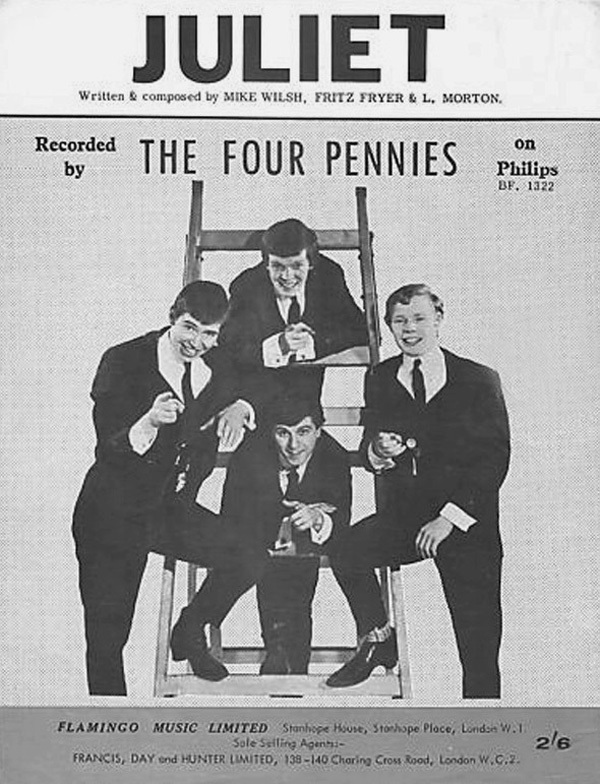 They were the Lionel Morton Four, before becoming the Four Pennies. They did open the new Reidy's, it was in last night's Telegraph. you know billyrovers when i thought about it i wasnt sure if they had opened it' or where just promoting "juliet" i remembered them doing something there' and that marie reidy had some kind of connection to them. didn;t know as blackburnlad stated it was in the telegraph though. i dont read newspapers it only encourages em to print more lies iv'e found. I recently saw a photo of the Four Pennies surrounded by kids and I'm sure it said they were at St James School below that. So probably it was while they were there putting the first pennies down. I think the photo was on Cottontown, or it could have been in a book I was flipping through. 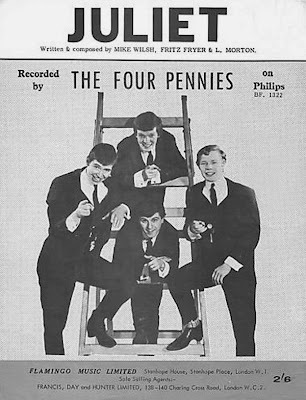 The Four Pennies were actually named after Penny Street, where Reidy's was (and still is) based, as Marie Reidy was a major champion of their cause at the time.